“…civilization is always a race between learning and disaster” H. G. Wells The current crisis in Tirana, Albania, can mainly regarded as unsustainable development in terms of environment, ecology and biodiversity progressive disappearance.These array of crises, are emblematic in the area of Paskuqanlake, because of its instability, mismanagement, uncontrolled land exploitation, natural resource implications and informal settlements.We have a clear "conflict or confrontation" between informal urbanization and nature. The research attempts to image ‘a sustainable solution` which relies on the role of an architecture conceived as an ‘osmotic barrier’. What actually Paskuqan represents is the opposite of these elements, where nothing is in equilibrium, where very little is left to chance and "control" or design of the spaces, where buildings behave hostile to the environment and landscape. The goal then is to design the barrier in a way, which is coherent with the local ecology, in order to emphasize that the city must provide a connection with the nature, as a very fundamental and important part. The idea is to establish sustainable functions along the border of Lake Paskuqani, through an architectural artifact, designed like a porous morphology. 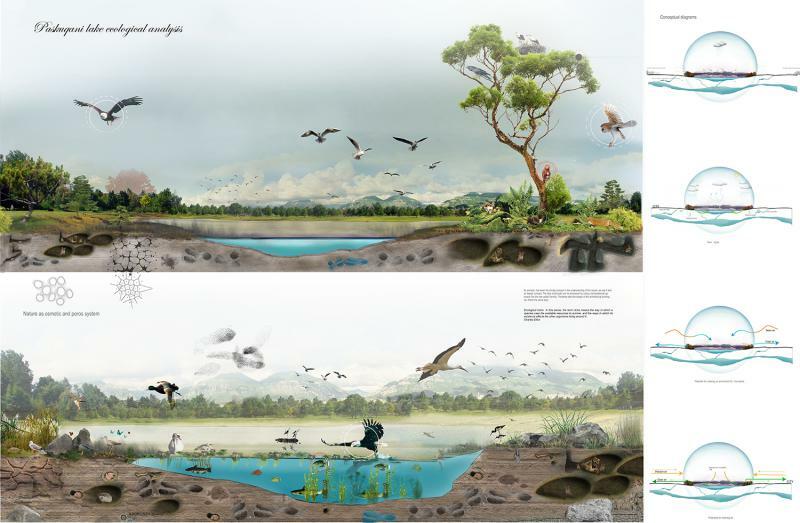 The main idea is to preserve the ecosystems and to reinforce them through the architecture design. The program of activities is focused on the same notions, by providing sustainable activities devoted to the relation between humans and nature. The Bio Museum and Research center is the building on which I focused more. Because of the concept of porosity was the driving concept in the understanding of the relation between nature and architecture, it became also a way to drive the design concept development. The idea of porosity, in fact,can be processed by using a computational approach like the one called Voronoi. Finally, the building rather than being a pure barrier, becomes a double side artifact: it can host human activities inside, and natural life outside through a porous structure which aims at hosting the vegetation and allowing the local ecology development.